Would you ever consider taking comments off your blog? →Argument ~ Would you ever consider taking comments off your blog? Argument ~ Would you ever consider taking comments off your blog? I think this is a crazy topic I want us to argue on today. I feel like I already know where most of our thoughts are but I still want to hear it out. I have been blogging for close to 3 years now and there are 3 things that keep bloggers together – Content Publication, Guest Posting and Commenting. Blog Commenting is the most interactive activity that generates more results in terms of networking, traffic and backlinking. We probably know how this has grown over time. The outbreak of commenting tools is indisputable proof that people like the conversation on blogs. Must Read: Hidden Blog Commenting Trick For Huge Traffic & Networking! Some however think otherwise! They think comments should be taking down from blogs. CopyBlogger as we know removed comments from a popularly known blog. While some of these reasons may be considered lame, some bloggers still think not having comments on their blogs is a better position. I love comments on the comment box below (yeah you now know my position) and I love your point shared on the Speakol widget below. What’s your opinion about taking off comments from blogs? Are you for or against comments on blogs? That’s wonderful topic and yes this needs to be discussed. Having comments turned on, especially when you have a bigger audience, could turn out to be a pain. Spam is a major issue. Having to moderate comments, clear spam, check out spam folders for genuine comments, blacklisting, white listing, dealing with broken links, dealing with bloated database due to lots of spam and much more – can finally make the comment section a challenging portion of the blog. Nevertheless, I don’t see closing down comments as an option for websites, especially blogs. Blogs are where discussions are generated. Unless you run a company blog where you only publish updates about your products, and your own company meetings, etc. turning off comments would be a crazy option. Even then, you would need your customers to get back to you for questions about the latest update or something like that. Well the story of Copyblogger is totally different. They’re giants in the field. And we cannot compare ourselves to them. They already have a following. My personal opinion: Apart from dealing with all the issues that rise from comments, I see the pleasure in being able to know what my readers are thinking; and what they think about my writing. The mere feeling that somebody is willing to leave a comment on a post I publish is rewarding – it shows they care and respect what I’m saying. So I would just find ways to control spam, and ease the moderation process; of course there are plugins for that! Thanks for bringing this topic up for discussion. Have a great week! Jane recently posted…Why your blog is boring and what you can do about it? That’s an impressive comment with lots of wisdom and knowledge thrown in. Yes for smaller blogs, comments are a great factor. But while your blog becomes huge, one may think the direction of copyblogger. for now, I think the advantages outweigh the disadvantages, at least for my blog ;). Thanks for your wonderful contribution dear friend. To me, I won’t stop accepting comments on my blog because it brings about engagement between me and my readers. It helps me interact with my readers easily and it’s very important to leave comments, most especially on tutorial blogs. So I don’t know the reason someone should remove comments from his/her blog. What if your blog gets hundreds of valid comments and hundreds of spam daily? What will be your reaction to comments? Won’t you change your mind and want to disable it? Agree with you it will cause me a hectic work but still for my readers with love take some actions, i will go with anti-spam measures with some great wordpress plugins like Akismet to defend myself 😀 !!! How could I not come when it talks of comments! Lol…you know my answer already, don’t you? All FOR comments as they are the lifeline of a blog – no two ways about it. Speaking of myself, my humble blog is where it is today, thanks to the relationships built through blog comments, and the social media as well. I never knew a single blogger before I started blogging, so all of this was possible ONLY because of blog visits, reading the posts, commenting on them, and sharing it further. I agree with Jane – the case with Copyblogger is different, and they have other ways to gain traffic and more eyes on their posts, and perhaps have been there, done that already. We cannot compete with them. As far as spam is concerned, I am getting NO spam at all now, and if there are such 1-2 comments, you can easily remove them. Regarding moderating comments, I’ve always done that and find it no hassle at all, one can approve them altogether in a second. So, no reason NOT to have comments. They are the only way we get to know instantly how our readers have taken up to our posts, whether they liked them or not. I think that interaction is SO important, and I value my readers and appreciate them for their time spent reading and commenting, and then sharing my posts. I think all of us do that, isn’t it? Now, your community is growing and at this pace, trust my words, you are soon hitting copyblogger’s zone. I know you can control spam and deal with moderating comments effectively. What happens when you get to the level of 100, 200 comments daily? I don’t know if that was their level but it’s possible. Tell me, do you think engaging VAs to reply to comments is a good idea? Enstine Muki recently posted…How to increase income with no increase in traffic! Lol…yes, it just so happens, thanks to the time zones that are in my favor I guess, while there are many blogs where I am late with my comments, again – it doesn’t fit into my time zone till I am free to comment. You bet it’s growing, and we both keep working on making things better at the ABC, and that takes a lot of time. You know all of this, as you too have so much on your hands. Not at all!! I wouldn’t! I think your voice and your opinions are yours alone. And hiring a VA or anyone else to reply to comments would be so artificial- so not you but someone else! I get a few comments from a blogger who I can make out is engaging someone else to comment, and perhaps their work is done, but as I know the blogger, it makes me think differently about the person as I know it’s a general comment, not the bloggers personal views. I completely agree with you. You may hire VAs to drop comments on other blogs and link back to yours. That’s what kingged has been doing and that got the platform some good expure. But VAs cannot reply in your state. They can’t have your brain and know what you would said in the reply. I thinks comments are like oxygen for the post. If there is no comments in the post, then it’s looking that there is no value of post. New readers who comes to read that post, will not so interested in that post. Comments increase the engagement and relationship in the blog post and create a great community. Thanks for your input Kumar! So excited to have you today sharing your opinion. Without commenting, actually I won’t know what’s going on in the minds of my readers. Week is going great Enstine. You say what’s going on ? Learn few new useful things relevant to the social media and blog traffic, sharing those things on my blog as soon as possible. I have to consider myself an expert on this topic since I study SO MANY FREGGIN’ BLOGS. With that said I updated my criteria for blogs to REQUIRE comments. I think people forget the ORIGINAL social media was BLOGGING. People publish content and then encourage feedback from their readers. When you cut that feedback piece off you are no longer having a conversation. Now it’s just a one way read-only experience and in my opinion it’s no longer a BLOG at that point. This is the mistake that copyblogger made in my opinion. good post. Excellent opinion if you ask me Jackson and thanks for voicing it out. I am even hearing for the first time that comments can cause bad SEO, I am only certain Google or other Search Engines will prefer to crawl blogs or websites with interactivity, that’s One of the Proof people are truly visiting the website. Edi Dominic recently posted…How I Received $25 Bonus with My MasterCard from Payoneer For Free! This topic will continue to wake up for many years to come in the blogging industry. As much as I do love comment and conversation on my blog, I still believe there are reasons a blogger may decided to shot comment section down on his blog. When CopyBlogger did it, I was among writers who kick against it and even publish a post on it. But later after my blogging career took a different dimension, I started seeing why “I may” attempt doing this crazy thing like removing comments box on my blog in the feature. 1. Removing comment on your blog will help you be more productive and efficient on content creation. 2. Depending on your blogging goals and objectives, you’ll have more time to market your content to those who will buy from you. Note I use the word “buy”, from what I can tell, most people who leave comments on blogs are just readers and not buyers. 3. If I can drive “huge traffic” from search engines, I may shot down comment on my blog. This is because most search engines visitors are just interested in taking away what they’re looking for on your blog and don’t have time to engage. 4. Readers, visitors, clients etc…..anyone with issue can reach you through the contact us page which should be visible on your blog navigation menu and other prominent places. 5. While huge volume of comments on blogs can be used for other marketing purpose, like attracting advisers, is still not a good metric to measure a blog success. Allow me to stop here for the moment, I will be publishing a post very soon giving reasons your blog need “Comment Off”. Before I published this post earlier today, I was talking with a reader who has a tech blog and was wonder what to do to get comments on it. My thoughts to him was that generally, tech blogs don’t really get comments. My of the readers come from search engines and once they get what they want, they are off. They can click links and banners to buy but for the most part, tech readers don’t comment. Blogs about blogging and online marketing on the other hand get a lot of comments from readers who for the most part are bloggers or marketers who do comment for backlinks and networking. Well, depending on our niche and products, commentators do buy. I have seen most of my comment authors buy from me and I appreciate that. Very interesting topic for sure and lots to say about it. I love comments. I think that they are the blood of our blogs right behind content, but they sure come with a price. There is a blogger friend of mine who decided to not comment on blogs anymore about a year ago, because she felt dragged down by it. It was time consuming for her, and she felt obligated at times to read posts she didn’t even really enjoyed. Now, this may be choking to some, but I understand her feelings, though. She said that she never regretted her decision. Her target market is NOT blog commenters anyway. So she still gets traffic and clients. So, in her case, I’d say she made the right decision. Secondly, some bloggers are a bit selfish, ya know. They want you to come to their blogs but they are not so eager to come to yours, and that at times annoys the hell out of me. Anyways, like I said, comments are important, but they do have their pros and cons as well. So good to see you here today friend and thanks for the exciting comment. You know from your friend’s experience, it’s important to know ones audience and niche. Some niches generally don’t get comments why some, comments are just standing behind content. Hi, Estine…I have been blogging now around 3 years also. Only on Slovenian market. The reason I mostly don’t turn comments on is because I my only purpose of blogs is to create leads. I know I could leverage blog potential with commenting on, adding social networks and quizes and so on. But, I prefer to get inquaries for products. Maybe I am doing it wrong because I am only targeting commercial keywords, but it works for me for now abd it looks I am not running out of commercial keywords ideas for long time. I am very closely measuring number of received inquiries from potential customers and as long as it is going up, I am not very fond to open up comments. Maybe one day I will. I tested already on some blogs, but I found out, I am not so keen of answering and discussing about topics too much. After all, I am a seller and my only objective is to sell. So good to see you here buddy and thanks for sharing your experience with us. I think it’s great thing for one to know his market and that’s just what you’ve done. If it works for you, then stick to it. However, you may one day try to open it up for a test run. That may increase your CTR and CR. If it does, then you’re better off with it. Thanks for sharing and exciting true story. That may encourage someone reading this comments. There’s no bloody way the thoughts of turning comments off on my blog can get into my head. Other blog owners may love comments off, The habit of just read and go but i can’t. I love seeing comments on my blog, Makes me feel i am not just writing! Yes people read it even if its a negative comment. And besides i think its one of the engagement factors really picky advertisers look at when trying to buy an adspot or something. Why turn it off? Although it eats resources and makes post load slowly due to the number of request coming from a number of post with huge comments and gravatar image included. I still prefer having my comment form turn up… Makes me feel good lol. Good to have you here today and thanks for sharing your valuable point bro. Now to the subject at hand, this is a great topic for discussion and I am glad you touched on it. There are many school of thoughts and the final decision will be based on the blogger’s personal preferences. I find bloggers use commenting primarily for networking and backlinks. If it were a site that is geared towards selling a product, then I am sure the frequency for comments will be far less. I probably don’t get as much comments like I should or would like to because I do not have plugins such as commentluv etc on my blog. That being said, while I would like more comments I do not have that much time to reply to everyone. And secondly, what makes my day the most is to see new readers commenting on an old post especially expressing how much they were blessed and helped by my article. Comments are also great because many times I have read articles of others, never quite understood it and only through reading the comments that I get the clarification or the understanding. So in that regard, comments should not be removed. I do get spam but Akisimet catches 99% of them and I just empty the spam folder. The other 1% that slips through must be manually approved and before I do, especially if I am suspicious of it, I check out the backlinks and just spam them myself. I perfectly understand your stand point 😉 If you are not full time blogger, dealing with 100s of daily comment can really be a pain. It’s not easy to reply to those comments especially if they are from real readers like you. Long comments like this you’ve made is the dream of every blogger. However, the longer the comment, the more time it takes to respond. Spam has almost stopped being an issue to worry about because there are lots of tools to fight it. Akisimet is one of these excellent tools and good to know it’s doing well for you. I’ve read some other articles of this website including monthly earnings also. I would like to congratulate you on your great website. Website without comment box is like a computer without internet access. It’s probably the best way to interact with our visitors without contacting personally. Hahaha! A computer without Internet is completely cut off the world and no one will like such a computer. That means comments are great right? Yes comments are great and also the best to have a great conversation. Sometimes, I prefers to post comment on my friends pictures instead of talking. Great contribution and thanks for being part of the discussion. What if your blog starts getting 100s of daily comments? Will you ever be there to reply to all? Enstine First of All Thanks for Reply. and Yes if my blog Start Getting 100s of Daily Comments i will try my best to Reply All Comments. I would never take comments off of my blog. This is been a huge win for me to increase engagement on my site. I was a nobody 3 months ago as it pertains to blog engagement. Now I regularly get 20+ comments on each of my posts. The secret? Blog Commenting. Blog commenting is one of the best ways I’ve discovered to network with other bloggers. It has had a dramatic impact on my site. In fact, if it wasn’t for blog commenting, I probably wouldn’t be blogging right now. I would have quit. So hell no. I would never consider taking comments off of my blog. Great topic Enstine. Love this debate. You really put up a very controversial debate. Few years back, CopyBlogger turned off its comment feature to get rid of bad and poor backlinks and spams. Which was certainly blow to all the bloggers as CopyBlogger was a superb place to get high authority backlinks. I think we should allow comments. Blogging is not an one man show. It involves networking and connection with all your audience and other bloggers, there might be spam, but we can’t turn off the comment feature because of that. Tell me what happens if your blog becomes as big as copyblogger? won’t you also take down comments? Thanks for bring up this topic, Enstine. I will never mind to keep the comment option on my blog. This is the only way to read what people think about my article and also about my blog. Some comments make me happy and some comments teach me something. Thanks for sharing your point of view Rabin. If I didn’t have comments here, I won’t have known you and your thoughts on this. i also enabled comments on my blogs ..
but some people will leave good comments and some were spamming on my blog.. Thanks for reading and dropping your views. BTW how is the week going? Blog commenting is important. And it’s something that I never really knew about for the first 6 months I was involved in blogging. But, when I started to engage with other bloggers and started receiving comments on my blog, I realized how important it was. I loved the engagement. And I think that blog comments, and commenting, has played a major role in helping my blog be where it is now. However, I can certainly see the reason why those big blogs would decide to get rid of blogging. If they’re receiving hundreds of comments on a post, then they must be receiving thousands of spam. And to go through and sort through the spam is very time consuming. I don;t see myself in a situation that I’ll even get rid of comments, but you can never say never. I certainly won’t be opposed to doing what Ana Hoffman does. Have G+ comments as well as comments. I read your recent post about boosting blog engagement where you wrote in greater details how commenting has improved over time. I perfectly agree with you and will keep improving on comments on my blog. This is a very interesting topic for a “debate”. As for me, I would not prefer taking the comments section off my blog. Why? Simple. I love interacting with my readers, I love hearing feedback from others, I love meeting new people and I love learning new ideas as well. It’s a way for me to further enhance my knowledge and to build a good relationship with my co-bloggers. Good discussion here and you know what I’m going to say: I love comments! I love to comment. To me it is the backbone of a blog. Now I have a plugin that tosses stuff into spam, but I still have t keep an eye out sometimes if the back link goes to a sales page. Not a review about a product but a real sales page…then I just take off the commentluv and may let them in if I know the person well. So yes..I keep those comments on and engage with many good people (like you) because I get full enjoyment by doing so. Good to know you won’t do that. I’m assured. I don’t think I have seen your face since the start of this year. Hello Enstine, I actually love getting comments and writing them on other people’s blogs too. I think it’s the easiest way to communicate with the person behind the blog, you get to know them, they get to know you and wonderful relationships can be born from doing this alone (I know because I have met many real friends through commenting). The topics I write about there are very personal and the only reason why the blog is public is because I know it can help other people too. I hardly ever promote that website or even talk about it and I’m happy the way it is, to me opening the comment thread on that blog would mean people can say anything they want and that is not the purpose of that site. If you go and visit it, you can see it has no social sharing buttons either because again, it’s a very personal project if I can call it like that. But if we’re speaking about a marketing blog or even a company blog, I think the comments should be open for sure. Yes I just checked your personal blog and it’s really as you described it whereas marketingwithsergio.com calls for engagement. I’ll be on it too shortly. LOL I don’t know man, I’ll worry when I get there. The blog was supposed to turn into a membership site at some point but I guess I never actually had the drive to do it or maybe I just got too scared of not having students. It depends on the type of site or should I say your website objective. For example I and may others use the WordPress platform for ecommerce sites and amazon affiliate sites so for those I would not have comments on. As for certain blogs, I can see how maybe some extremely big news sites might turn them of or perhaps a blog that is strictly a give information only type thing. BUT for the most part a traditional blog should keep comments on as that was one of its original attributes that makes it so interactive which to a large degree indirectly spawned the era of being social online. Caleb recently posted…Ever Dreamed of Being Super Human? In my opinion blog comments are the best way to engage with your readers and solve their problems. We shouldn’t remove comments from our blog. Comments are the best way of interacting with our blog readers. They play a effective role in networking. With the help of comments we can solve our reader’s query and know what they really want , what their interests are. This also helps to get what we have to write next and also maintains a connection between blogger and readers. This way we can get a regular traffic , build trust and even generate income. On the other way bloggers who get huge traffic disable comments to save time of replying the comments but if they take some time for the comments , they can even get more better exposure for their blog. If it comes on me , I will never disable comments on my blog as they will not only help me in interacting with my readers but also help in many other things too. Very interesting topic and it yet to achieve its momentum as a huge majority still can’t imagine removing commenting option from their blog. 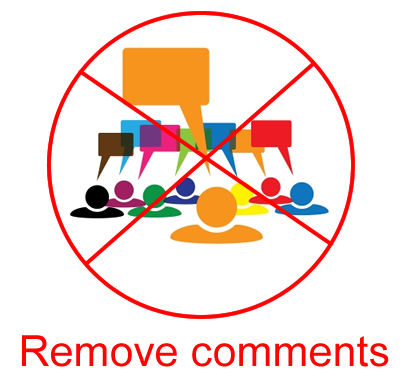 As we all know that there are two basic objectives to allow comments at a blog. So these are the objectives and once they are achieved they become the benefits of blog commenting. But the question is who doesn’t want to get these benefits or who already has achieved these objectives through other sources. So such blog may say that commenting is not good option as they already have built a strong community and have got so high ranking and now can manage both the things by regularly publishing high quality contents offering more and more benefits to their readers. As far as the common problems one face due to comments as you also mentioned in your post are obviously manageable as we have so many free and paid plugins to ward off these problems. As far as time management to moderate and reply the comments is concerned it is the basic requirement of every business to offer best customer care to their each customer. So here one can develop skills to moderate and reply comments with minimum time and achieve maximum conversion objectives with them. So my vote is for commenting option for all those blogs who yet to gain the level of Copy Blogger. On the contrary those who think they have achieved that level are going at fast pace to achieve it they have sound reason to remove it and just keep focusing at offering more and more value to their visitors as they already have developed with highest trust level with them. It equally depends upon blog niche as well. If niche is sports then there is not much need of it as people don’t visit a sports blog for the solution of their problem so they don’t feel need to comment there and share their problems. So niches where people have more problems should have commenting option while the ones that are usually visited to get information or pleasure does not require as much strongly. Last but not the least it also depends upon money making objectives of a blog also to either put the commenting option or not. If someone is in a business of product range like all premium tools of WordPress blog then it is must to retain it. While selling randomly whatever product related to a niche – directly and indirectly – does not require much to put this option. Thanks a lot for ignited such heated debate and as shown from the viewpoints of several wonderful bloggers here that there is no definite answer of this question and it may vary from situation to situation. Thanks for putting up such a brilliant and detailed comment. You have justified your point by looking at the subject from different angels. I have almost nothing to add except that our niche needs interactions on blogs so at the very basic level, comments should be enabled to encourage growth. Comments are bring to the website a lot of good things, why we need to turn it off ? No way :). The number of comments can tell how popular your blog is and if you use commentluv, more readers will come to your blog. Your contribution is highly respected and thanks for being an active member of the blog. It’s really difficult to answer this question because there’s always many reasons behind whether or not a blog should have comment. But from my 10 years of marketing and blogging online, here’s what I believe – When your blog is below 10,000 traffic per day, you should have comment but if your blog is over 10,000 traffic per day than consider closing it and put it onto another platform where audience are more serious about your niche or topic. Not sure if you know, Copyblogger had transfer all their discussion for new post onto LinkedIn, because they believe people with LinkedIn account are more serious people within topic discussion. Anyway, if you ask me, I will still have comments on my blog even if I had a large audience unless you had a team like copyblogger to bring discussion over to another platform, it’s better to stick with what you have right now. I think the best thing is to wait and get to that point. the prevailing situation will help in your direction to take. I think its up to the blog owner. Some posts or blogs are best served by limiting the discussion and opportunities for trolls to take over and some blogs require or the discussions surrounding the original posts are more worthwhile. Personally, I would never take comments off my blog as it is the best way I get to interact with my readers and help them with their queries. Not to forget, I am always open to the reader’s feedback which keeps me motivated and enables me to deliver even better content. Maybe now that the comments are not in their hundreds, we can happy deal with them. What about 100s of daily comments? I think it will not be a good thing to stop commenting system for blogs. Every blogger should accept comments because this is the opportunity bloggers get inspire from readers. Thank you. According to me, the comment section is a very crucial part of any blog. I believe that every blog should have comments activated as it creates discussions that blogs are for. Comments help us to connect with our readers and we can understand what they want and how our contents have influenced them. It has the power of creating a very strong relationship with readers. So it’s very important to have it turned on. However, different bloggers have different opinions and i don’t want to judge. But i think without blogs are not blogs, but something else. As a blogger, if you are turning off comments, it simply means that you don’t care about what your readers feel. It just doesn’t matter. You don’t want to communicate with them or let them share their ideas. By the way, we can’t compare ourselves with copyblogger like blogs. That’s such a huge blog with so much more contents and huge audience. If they have taken such a big decision of turning off comment section, there must have been some reasons. Tamal recently posted…21 Highly Effective Ways to Monetize Your Blog Now. Actually, I would never take remarks off my website as it is the most ideal way I get to connect with my perusers and help them with their questions. Not to overlook, I am constantly open to the peruser’s criticism which keeps me propelled and empowers me to convey shockingly better substance. That was great to have you here and thanks for the contribution. It’s good to be aware of both the advantages and disadvantages. In my opinion the advantages generally outweigh the disadvantages though. Maybe a celebrity could get away with having the comments turned off. People will follow them anyway. Generally though, blogging is seen as such an interactive thing that I think it would usually work against a blog not to have comments. I read an interesting blog post this week and wanted to comment but there was no option to do so. It was an interesting post but I didn’t feel inclined to follow that blog. That’s a great reaction and thanks for taking the time to post. I don’t see any celebrity personally responding to comments. For the most part, they have content managers and as you know these may not really interact with readers as the real icon would have done. I couldn’t imagine removing comments from my blog; it’s always fascinating to see what people are getting out of my posts. It’s valuable insight and helps keep me on track – I can clearly see if I’m getting my intended messages across or not. Akismet does a fantastic job of removing the real spam, if only there were a way to get rid of all the “Great post, nice tips” comments. If nothing else I suppose those sorts of comments make it clear when someone’s just doing their rounds for the day. I believe if you’re a beginner or if your’e struggling, I believe you shouldn’t even consider the thought of turning your comments off. When it comes to growing your blog, the best thing you can do is network and engage. By building a following, it makes it a lot easier to grow a blog. Now if you have the money to invest in SEO companies as well as other services, then it would be plausible for you to grow your blog without the networking up to an extent. But besides that, coming from my own experience, there’s no way you can build one. This is the aligned with the law of reciprocity, so you definitely want to practice this with your blog, especially when theirs a big time blogger who you can get a backlink from through your comment section. I love having comments on my blog! Having comments makes the whole exercise worth-while. I get a BIT of spam, but Akismet and CommentLuv sort most of it out. I may be late to this conversation but I still want in. I really don’t think it should be an argument because everyone has their own opinions and wants to do their own things. As you know I don’t think there is a one size fits all scenario for any given thing so we each have to do what’s best for us. Some of the larger blogs have started closing their comments and moving the discussions to social media. I can’t remember whose blog I was on last month that said he just wasn’t getting the comments like he use to so he closed them because all the conversations where over on social media. I oftentimes scratch my head thinking to myself well I’ve been a this going on four years now and mine haven’t slacked off. Obviously he’s not doing something he once was in order for that to be the case. Of course you know how I feel about this topic. You don’t own anything online that’s not on your blog. So if those social media accounts were to go away for any reason, which we both know has been done to some heavy hitters before, all those conversations are gone. What proof do you have now that people enjoyed what you shared? I don’t know, I just look at my blog as my home and that’s where I prefer the discussion to be. If people refuse to stop by and share their opinions there then that’s their right. If they want to have it on another site I won’t not speak to them for goodness sakes but I’m going to do my absolute best to get them back to my home. Anyway, that’s the gist of it in my opinion and I enjoyed seeing what everyone else thought too. I don’t think every single person will ever 100% agree about this. Great topic though and thanks for bringing it up. Seeing comments on your blog is really a great thing. It shows that there is someone who reads your blog and your writing is getting cashed. By the way, I really hate it when someone post a spam comment on my blog. Don’t know why people are still doing it, while it does no good to them. Instead, it brings negative results in terms of SEO. But still I am not going to turn off the commenting system. This post is a perfect example of why blogs should always have comments enabled. Can you imagine requesting your readers to share their opinion on whether blogs should have comments, then not providing the facility to comment? That would be crazy! So, yes. Comments are a fine way to gauge the effectiveness of our content strategy, and also to discern and meet the needs of our clients.